2014-15 OHL Coaches Poll Winners - How did the Barrie Colts do? - Very Barrie Colts | A website covering the Barrie Colts of the OHL. Home 2014-14 Andrew Mangiapane blog CHL Coaches Poll Joseph Blandisi Kevin Labanc Mackenzie Blackwood OHL Poll Rasmus Andersson 2014-15 OHL Coaches Poll Winners - How did the Barrie Colts do? 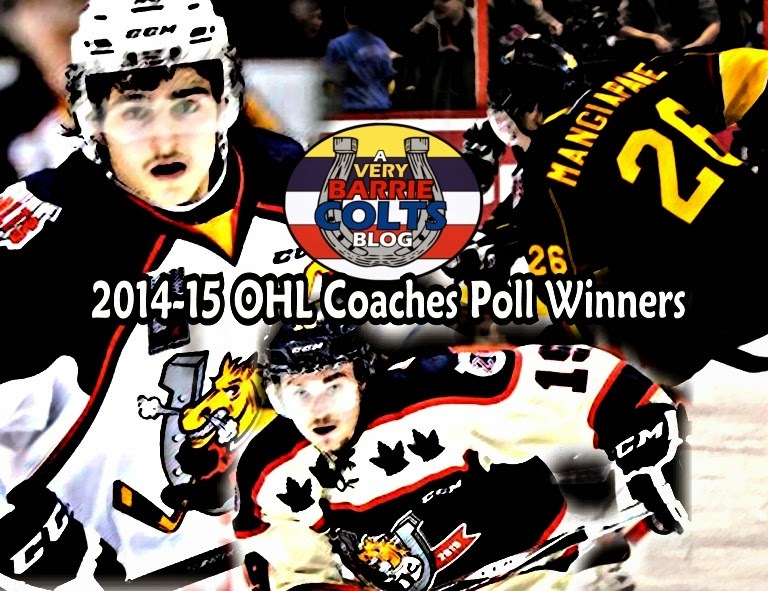 2014-15 OHL Coaches Poll Winners - How did the Barrie Colts do? Yesterday the Ontario Hockey League announced the results of its 2014-15 Coaches Poll for the regular season. There were 20 categories that are split up between both the Eastern and Western Conference. Barrie Colts landed in 8 of these categories. Note: The number in brackets reflects the results of the final point totals. How do you feel about these coaches rankings? Do you have any ideas of players that would fit a certain album? Let us know in the comments, on our Facebook Page or on Twitter!